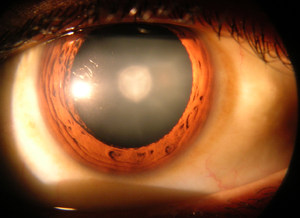 A cataract is a cloodin o the lens in the ee which leads tae a decrease in veesion. Cataracts eften develop slawly an can affect ane or baith een. Symptoms mey include fadit colours, blurry veesion, halos aroond licht, tribble wi bricht lichts, an tribble seein at nicht. ↑ "Facts About Cataract". September 2009. Retrieved 24 May 2015.